Platinum, White Gold or Palladium – which one should I choose? 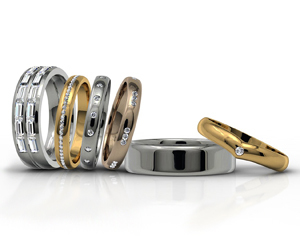 There are a wide range of wedding ring profiles, weights, widths and patterns available in all precious metals as well as other non-precious metals such as Titanium and Stainless Steel. This can seem a daunting prospect at first - but we have the expertise to help you select the ideal pattern for you. As specialist bespoke designers we produce wedding bands that sit neatly alongside engagement rings so that the rings complement each other perfectly. However it is not always necessary to go down the bespoke route as we often find the ideal matching ring within our extensive ranges of wedding ring patterns and designs, available in-store for you to try on. Together with our expert guidance this makes the process of choosing very straight forward. Our plain wedding rings are available in any profile, width and precious metal, be it Yellow, White or Rose Gold, Platinum, Palladium or Silver, and in general only take 2 - 4 weeks to make up in your exact finger size. On rare occasions we have had to pull out all the stops to produce sets of wedding bands for customers within a couple of days! 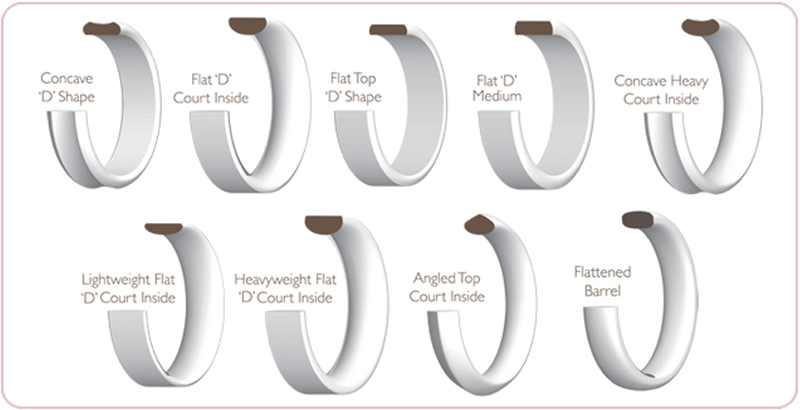 Below are some of the many profile options and plain wedding band styles we supply - How would you like yours? In certain cases it is necessary to produce a shaped wedding ring which will locate or flow with the contours of the engagement ring. 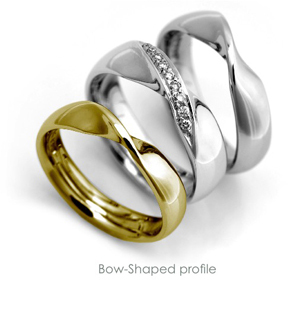 This ensures the two rings compliment each other perfectly and avoids the visual discord of awkward gaps and excessive wear that would otherwise occur with a conventional straight-sided band. 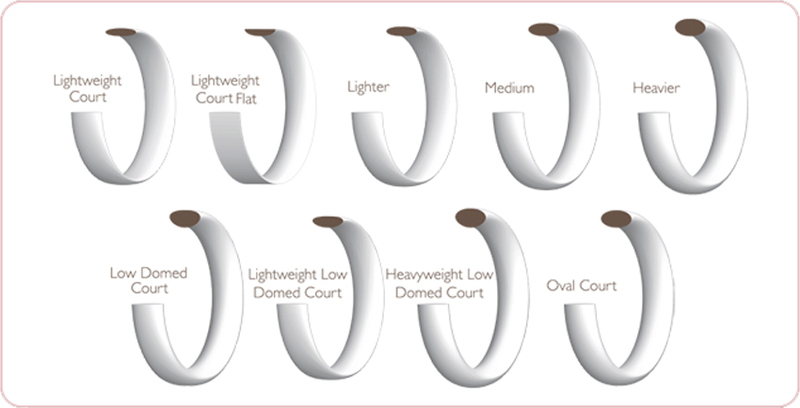 We have a comprehensive range of shaped ring patterns in stock for you to view and try on. So to find one of these that worked for you either as is or modified to suit would certainly be the most economic route. To see a large selection of the available options, please click here. Of course if you would like or need a completely unique design, why not make an appointment to see one of our designers for a free consultation. Setting sparkling diamonds; Brilliant-cuts, Princess-cuts and others into plain profile bands is increasingly popular and provides an attractive accent to your wedding band. We can suggest design options, spacing styles and give guidance as to how best to set and configure them to achieve your aesthetic preferences. Below is a selection of our offering to give you some ideas. Feel free to call in, our in-house designers are always available to help you plan your perfect ring - How would you like yours? Any plain band is available in either polished, satin or various textured finishes. There are also a large selection of diamond-cut patterns. More recently due to the development of laser technologies, the design possibilities are endless and allow us to create designs and patterns that would be impossible to achieve by any other means. Below is a selection of just some of the options available. Of course if you would like a completely unique design, why not make an appointment to see one of our designers for a free consultation. How would you like yours? Feel free to call us on 0114 266 4066 or simply drop in to discuss your requirements and ideas with our friendly expert staff.